The Indian flag was designed as a symbol of freedom. The flag is a horizontal tricolor in equal proportion of deep saffron on the top, white in the middle and dark green at the bottom. Therefore it is also called as "Tiranga" (or "Tricolor"). The ratio of the width to the length of the flag is two is to three. In the centre of the white band, there is a wheel in navy blue to indicate the Dharma Chakra, the wheel of law in the Sarnath Lion Capital. Its diameter approximates the width of the white band and it has 24 spokes. The Saffron Color :The saffron stands for courage, sacrifice and the spirit of renunciation. The White Color : The white stands, for purity and truth. The Green Color : The green stands, for faith and fertility. The spoked Ashoka Chakra in the center of the flag replaced the Gandhian spinning wheel to add historical "depth" and separate the national flag from that of the Indian National Congress. This Dharma Chakra depicted the "wheel of the law" in the Sarnath Lion Capital made by the 3rd-century BC Mauryan Emperor Ashoka. The chakra intends to show that there is life in movement and death in stagnation. The design of the National Flag of India was adopted by India's constituent assembly on 22nd July, 1947. It's use and display are regulated by a code. On 26th January 2002, the flag code was changed. After 52 years, the citizens of India are free to fly the Indian flag over their homes, offices and factories on any day. Now Indians can proudly display the national flag any where and any time. There are some rules and regulations upon how to fly the flag, based on the 26 January 2002 legislation. 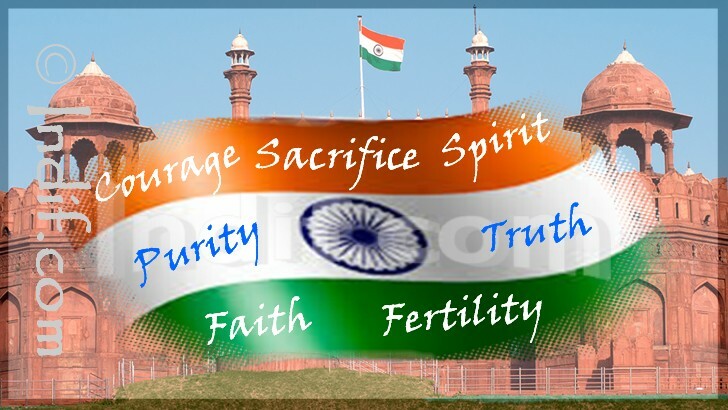 To know the new Flag code of India visit http://mha.nic.in/nationalflag2002.htm. "A flag is a necessity for all nations. Millions have died for it. It is no doubt a kind of idolatry which would be a sin to destroy. For, a flag represents an Ideal The unfurling of the Union Jack evokes in the English breast sentiments whose strength it is difficult to measure. The Stars and Stripes mean a world to the Americans. The Star and the Crescent will call forth the best bravery in Islam." "It will be necessary for us Indians Muslims, Christians Jews, Parsis, and all others to whom India is their home-to recognize a common flag to live and to die for."